For some, Cebu is just like Manila - urbanized, fast-paced living, heavy traffic. At some point, there really is a resemblance. But for me, Cebu is a lot different. We've been going in and out of Cebu every year since I and my husband became a couple. This is where he proposed to me (in an island I can't even remember the name). The city center might be similar to Manila, but the beaches up north and down south are something you cannot find in the metro. Last year, we were amazed by Northern Cebu's pristine beaches of Bantayan Island. This year, we decided to head down south, intrigued by the famous Sumilon Island. Sumilon Island can be reached via a one hour flight from Manila to Cebu and a scenic 3-hour drive to Oslob. The land trip may appeal boring for some, but for me it's otherwise. We passed by some old churches and made some stop to buy pasalubong (treats). From the city, you will pass by CarCar where you can buy chicharon (pork rind) - the best I've ever tasted so far and comparable to Nueva Ecija's inantala (sundried pork rind)- and Argao where you could buy homemade tablea (cocoa tablets) and torta, a bread made of flour, eggs and tuba (palm wine). In no time, we arrived at Bancogon wharf where a pumpboat is waiting for us. This is the only wharf I've seen with powdery white sand onshore. We were given welcome drinks before we hopped onboard. The wharf is made of wood planks, a bit scary for someone like me who has fear of heights. But with a view like these, I conquered my fears. The pumpboat is huge enough to fit a large group of people. This is even bigger than the passenger boats in Caramoan, and looks more durable and safe. It is equipped with standard life vests for kids and adults alike. The boat ride is approximately 5-10 minutes. 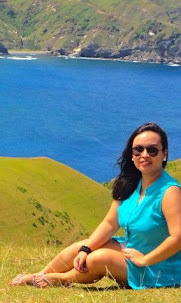 Upon approaching Sumilon Island, I can already see the clear waters and fine sand my friend had on her photo. This is by the way what they call the shifting sandbar. It shifts its shape from time to time. From here, Sumilon Island's Operations Supervisor Nikki Gutierrez together with the other staff at Sumilon Island welcomed us and led us to our room facing the sea. This started our Sumilon Island escapade. Find out more in the next few days.